Audi TT Coupe Performance, Engine, Ride, Handling | What Car? 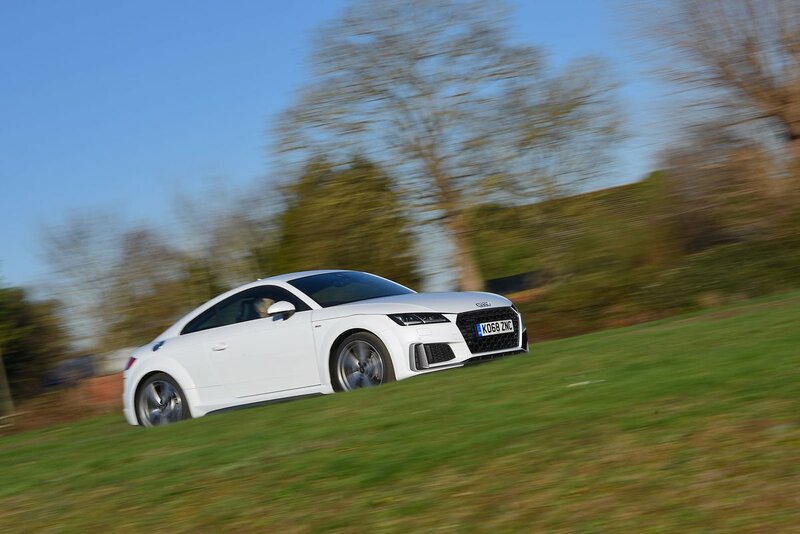 The TT’s all-turbocharged engine range is pretty straightforward. 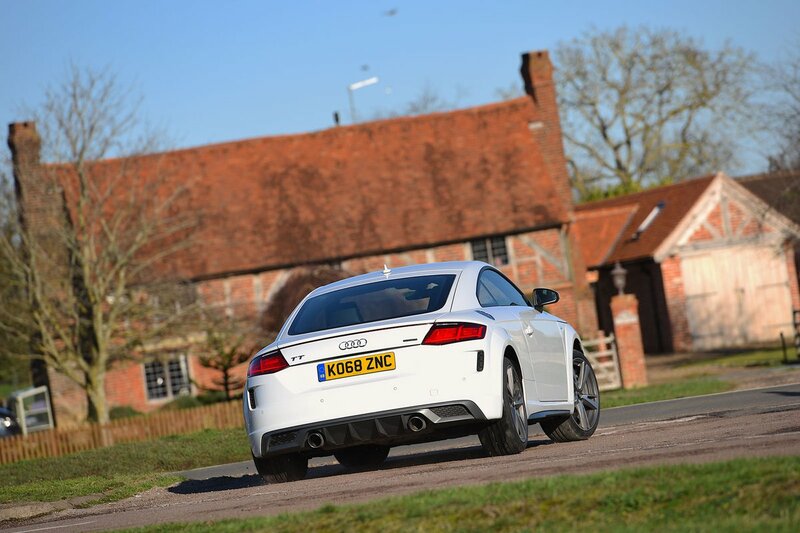 The line-up consists of three 2.0-litre petrols – one with 194bhp (badged 40 TFSI), another with 241bhp (badged 45 TFSI), with the 302bhp version reserved for the TTS. The diesel option was discontinued after a rapid decline of diesel sales in the coupe segment. We have yet to drive the entry-level 40 TFSI but we suspect it will offer the best value for money yet should still deliver the lively acceleration TT buyers crave. They’ll still be tempted by the more powerful 45 TFSI, though, which feels fast at virtually any revs and will crack 60mph in less than six seconds. Both engines are available with a choice of front or four-wheel drive – dubbed quattro by Audi – but the latter is heavier and only shows an advantage in wet conditions. At the top of the range (for the moment, anyway) the TTS is so quick that it will just pip the Porsche Cayman from 0-62mph. With four-wheel-drive traction as standard, none of the power is squandered; you simply point the car in the direction you want to go and give it as much gas as you see fit. Stick it in Dynamic mode and the throttle response sharpens up, the S tronic automatic gearbox holds on to gears for longer, and the exhaust even makes a satisfying – but manufactured – burble to soundtrack your back-road blast. The TTS should satisfy the speed-hungry until the TT RS arrives. It’s due later in 2019 and promises great things – the old model had a 2.5-litre turbocharged five-cylinder petrol engine with 394bhp, and a 0-62mph time of just 3.7sec. The standard suspension gives a firm but generally comfortable ride, and even the optional sports set-up (available for no extra cost on S line versions) never makes things too bumpy. All set-ups are a little crashy over motorway expansion joints or particularly intrusive drain covers, but it’s nothing that you’d ever tire of. Add big wheels (options up to 20in are available), though, and you’ll feel every imperfection in the road. We reckon it’s worth resisting the temptation if you value comfort over sporty looks. The TTS comes with adaptive dampers, which form a system Audi calls Magnetic Ride. This is also available as an option on cheaper models and allows you stiffen or soften the suspension to your taste. It’s a great system and makes a noticeable difference, especially when you switch between Comfort and Dynamic, but isn’t something one we’d put down as a ‘must-have’ option. Turn into a corner and the light, accurate steering gives you a good sense of what the front wheels are doing, so it’s easy to judge when you need to back off a bit. 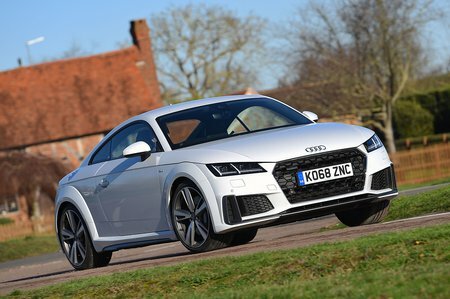 The TT also feels nimble, grip levels are huge and there’s hardly any body lean – especially in versions equipped with the stiffer sports suspension. In wet conditions, the front-wheel-drive 45 TFSI TTs can struggle to transfer all of their power to the road when accelerating out of corners. The four-wheel-drive versions, on the other hand, are virtually unflappable. The Audi TT is a sports coupe, so it was never likely to be as hushed as a luxury limo. However, while there’s noticeable wind noise around the frameless windows and a bit of suspension noise over bumps, this is still a pretty quiet cruiser – certainly when compared with rivals such as the Ford Mustang. The six-speed manual gearbox has a slightly long and un-sporty shift action, but it’s light and precise. The S tronic automatic gearbox (standard on quattro models and an option on front-wheel-drive and TTS variants) is generally slick, apart from being a little jerky at slow speeds, especially when left in Dynamic mode. Gear changes can feel a little stilted when trying to gain speed, but you can make seamless manual changes through the steering-wheel mounted paddles.